Effluent wastewater, on the far left, is processed at Tehachapi’s Waste Water Treatment Plant. 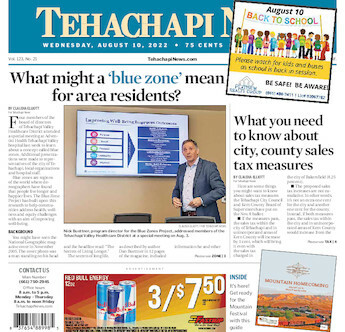 Treated water could recharge in the Tehachapi aquifers, although pipes would have to be placed to pump it up the hill to Blackburn Dam, near Tehachapi Mountain Valley Airport. It's estimated to cost more than $10 million. Plans to bring it before the City Council are being made, Garrett said. If the project became reality, the potential to spread up to 1,500 acre-feet per year at Blackburn Dam would require an upgrade at the wastewater plant to produce tertiary disinfected effluent, according to the city of Tehachapi’s 2018 Annual Report for the Summary of Reclamation Operations at the WWTP. Tertiary disinfected effluent is a high level of treated water and comes after a primary and secondary process, said Scott J. Hatton, supervising engineer for the California Regional Water Quality Control Board. Effluent treated water is the final product at a facility, but it's not disinfected and cannot be used to grow crops for human consumption. “The city has executed a conceptual study to investigate our current and future wastewater treatment and reclamation practices. At this point, no project or funding has been approved by the City Council to move forward with the project,” city Public Works Director Don Marsh wrote in an email. In 2016, the city completed an Indirect Potable Reuse Conceptual Study to evaluate the "feasibility of indirect potable reuse of its treated WWTP effluent," according to the city of Tehachapi’s 2018 Annual Report for the Summary of Reclamation Operations at the WWTP. Airport users are concerned that reclamation land at TMA is not being used for aeronautical purposes. Now the city is investigating other ways to remove the treated effluent water. Wastewater storage at the plant consists of 39 acres of effluent reclamation areas, according to a 2018 Reclamation Area Soil Sampling report for the WWTP from BSK Associates. Treated effluent was applied to 53 acres of farmland at the TMA in 2018. A borrow pit is also used for storage off of Tehachapi Boulevard. About 65 percent of the capacity of the treatment plant is being used. Land at the wastewater facility needs to be left open in case residents start using more water, or a catastrophic event occurs, said Tyler Napier, utilities manager for the city in an interview. The city's access to water is limited.